This deals with: Parapsychology – from magic to science; parent-child symbiosis – cradle of ESP; decline of magic and metamorphosis of witches; the neurotic mother – witch of our time. As the book is 40 years old, I found it out of date with modern thinking. I’m not sure when MRI scanning was invented (1970s? ), but being able to see how the brain works, especially in infants who are too young to be influenced by external knowledge, has given us a great insight into what is learned and what is inherited, the commonly known phenomenon of nature versus nurture. This has probably lead to a greater understanding of the parent/child symbiosis. I’m not sure either if the modern day witch would like to be thought of as a neurotic mother. Witches were the wise women of their day. Some, I agree were manipulative “psychotherapists” and probably still are in some of the more obscure cults of the world, but in my experience, even modern day traditional witches seem to possess a talent denied to most of us, in being able to see the world and especially people, in a different way to less talented folk. This maybe a better developed ESP faculty and in some people it can be encouraged and expanded by training the brain. As I have not yet read the whole of the book, my following remark may be a little judgmental, but I have read elsewhere about the cold war practice of remote viewing, where individuals showing a talent for this were used by governments to “spy” on other countries. This deals with telepathy in the psychoanalytical situation, psi in psychotherapy, predisposing and conditioning factors, dreams, drugs and ESP, precognition or self-fulfillment in dreams and myth. While I realize that the case studies were personal experiences of Dr. Ehrenwald, I can understand where modern skepticism comes from, when none of the information can be verified by double blind and peer review practices. Dr. Ehrenwald states there are a number of factors at work here: tracer elements, which lead to anticipatory intuitive and telepathic responses. These seem to have mainly been studied in patients with a problem they needed to have solved. He does not make much mention of using “normal” people as base line standards for his theories and findings. Hits and misses of psi phenomena seem to have been tested on patients with quantifiable problems. There is a need to prove psi phenomena which come into the same brain function as creative acts, neurotic symptoms, dyslexia or organic speech impediments. In the section on drugs, dreams and ESP, the book was written at the height of psychedelic drug (ab)use. A balanced view of the factors involved do include the placebo effect, and test results show a better than chance outcome. It would be interesting to repeat the tests in an MRI scanner to see which part of the brain is responding to the drug influence. In one case history, citing the dreams of a marijuana user, Dr. Ehrenwald analyzed the results as being the result of psi factors only, dismissing the involvement of the drug. In view of modern knowledge of cannabis psychosis I wonder if he would come to the same conclusion today. He did go on to say that his patient had another dream six weeks later which had a purely psychological interpretation with no drug input. (further information: Cannabis Psychosis). Re my previous comment about modern testing methods, Dr. Erhenwald does mention that reliable double blind research into drug reactions on the psyche had not been developed at the time of writing. He claims a unifying bond underlying prophecy and myth. As devil’s advocate, I postulate that he actually argues against himself when he mentions mis-translation from one language to another, (specifically the virgin birth from the Hebrew prophecies) to facilitate the prophecy to come true. My thought is that there is some element of Chinese whispers involved over centuries of re-telling the same story. For those not familiar with the party game, the sender whispers to the first person in a large circle of participants : send re-enforcements, we’re going to advance, and after many repetitions he gets back the message: send three and four pence, we’re going to a dance. Sometimes I think that too deep an analysis misses the obvious face value truth. Schizophrenia and psi pollution. Evidence of this is inconclusive. However, by his own experiences as a recent arrival in England from middle Europe in 1942 and his subsequent interaction with patients in a mental hospital, the author does show some foundation for a connection at least in some patients. After many case histories, Dr. Ehrenwald states that by his own observations and those of his conferers, there is no evidence that schizophrenics are more or less liable to exhibit psi phenomena. I have wondered myself if, a knowledge of the parts of the brain which modern medical treatments influence to reduce schizophrenic tendencies, could be used to provoke more psi activity. Dr. Ehrenwald argues a good case for treating possession and exorcism with a psychiatric approach, keeping a look out for psi components such as speaking in a language unknown to the patient. His doubts about poltergeist activity being caused by psychokinesis (PK) are voiced, but he admits some well documented cases stand up to scrutiny. On witch-mothers and the children of Salem: the bottom line of the Salem witch trials is one of the children being repressed by parental authority, becoming hysterical and accusing the adults of witchcraft, and in the un-enlightened 17th century, this was ultimately the downfall of the adults. The scenario is reminiscent of more ancient stories such as the fairy tale of Hansel and Gretel, Lilith in Hebrew mythology and Media in the Greek myths, i.e. stereotypical behavior of figures buried in the subconscious. A more recent occurrence is the Hitler Youth testifying against their parents. Dr. Ehrenwald’s case studies of ‘gifted’ people, including amongst them Hitler and Uri Geller, make interesting reading. Given that the early parts of the book argue for an acceptance of proof that psi phenomena are physically real, it seems logical to me that eventually some verifiable means of quantifying them by experiment and observation will be found. This section is given over to philosophical debate with sections on personality and mind stretching. As with the whole of the book I found it very easy to read, but I don’t intend to expound on the ancient and more recent philosophers, whose words of wisdom are probably familiar to anybody reading Dr. Ehrenwald’s book. I will say on a personal level, I have for many years been aware that my ‘body’ is a vehicle for my mind/consciousness. Most of the time I am not aware of my physical body, and when I consciously look in a mirror to view it, I’m aware that the real me is looking at the outer me in a way that others see me. 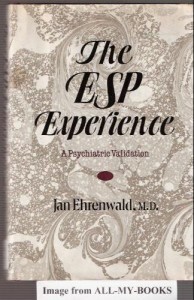 In the chapter on psi phenomena in search of a neural foothold, Dr. Erhenwald raises the question of not how ESP and PK incidents come about, but what stops ESP from flooding our perceptual world with a steady influx of trivial material and, indiscriminate PK impulses wreaking havoc in our lives. He also postulates that this may be a link to uncontrolled poltergeist activity in children and tales in folklore, magic, witchcraft and Christian demonology. Experiments with telepathic drawing seem to suggest that there is a physical component, some ‘receivers’ being better able than others to reproduce the target drawing. Again, I think MRI scanning while investigating this phenomenon might help but, if my theory is correct, this method would block the reception due to the magnetic field, in subjects usually able to receive and duplicate drawings. His chapter concerning precognition and clairvoyance again (at this time) is probably impossible to verify even though anecdotal evidence is very pro their existence. Were he still alive now he would be 111 years old. Having never experienced psychoanalysis personally, I wonder, when reading this book whether the Jung/Freud etc approaches to how we work mentally are even totally valid in modern times. From this, I wonder if the American preoccupation with analysis and their group consciousness is so different from the British because of its out of date thought – just my musings……….. Thank you to Anne Morgan for contributing this (our first!) book review at Psychic Revolution. From her insights, I hope you agree that it is clear to see that Anne is widely read and especially conversant with subjects that intersect with the paranormal. Thank you again Anne.